The record is made up of 1 file (100 folios). It was created in 1 Jan 1948-31 Dec 1948. It was written in English. The original is part of the British Library: India Office The department of the British Government to which the Government of India reported between 1858 and 1947. The successor to the Court of Directors. Records and Private Papers. 2 °7o PAKISTAN CURRENCY . of repatriation to their respective countries. 208. PERSIAN CLi.IM TO B AHRAIN. intensive propaganda regarding their claim to Bahrain. islands were to be handed over to Persia. of a large new shop and restaurant called the Moon Stores. The file contains fortnightly intelligence summaries produced by the Political Agency An office of the British Government and, earlier, of the East India Company. at Bahrain for the year 1948. 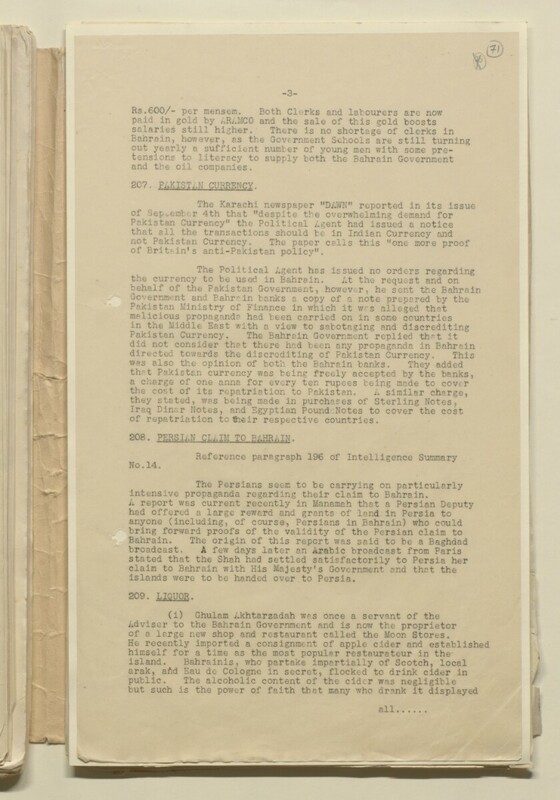 The reports, marked as secret, were sent to the Government of India, the India Office The department of the British Government to which the Government of India reported between 1858 and 1947. The successor to the Court of Directors. , and numerous diplomatic, political, and military offices in the Middle East. Each report is numbered from 1 to 24 and covers a two week period. The final page of the final report appears to be missing. Foliation: the foliation sequence commences at the front cover with 1, and terminates at the inside back cover with 103; these numbers are written in pencil, are circled, and are located in the top right corner of the recto The front of a sheet of paper or leaf, often abbreviated to 'r'. side of each folio. A previous foliation sequence, which is also circled, has been superseded and therefore crossed out.